The East Siberian Laïka is a hunting dog of the spitz type that was developed to hunt large came such as deer and bear. Traditionally they were also used as draft/sledge dogs and drovers. They are one of three Russian Laïkas (or 'barkers'), the other two being the West Siberian and Russo-European Laïkas. At one time a fourth Laïka was recognized, the Karelo-Finnish Laïka, but this breed was merged with the Finnish Spitz in 2006 due to having minor differences. Descending from spitz-like aboriginal dogs kept by native tribes, the East Siberian Laïka comes from a large range which meant that these dogs were once very diverse. 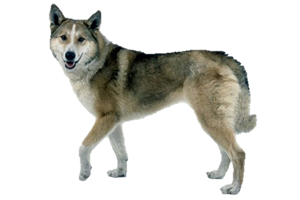 The largest of the Laïkas, this breed was sometimes crossed with wolves to 'strengthen' the bloodline, but this practice was discontinued by the middle of the 20th century. Is the East Siberian Laïka Right for You?